The goal of St. Charles Borromeo Confirmation program is to invite teens to encounter Christ & develop a relationship with Him. 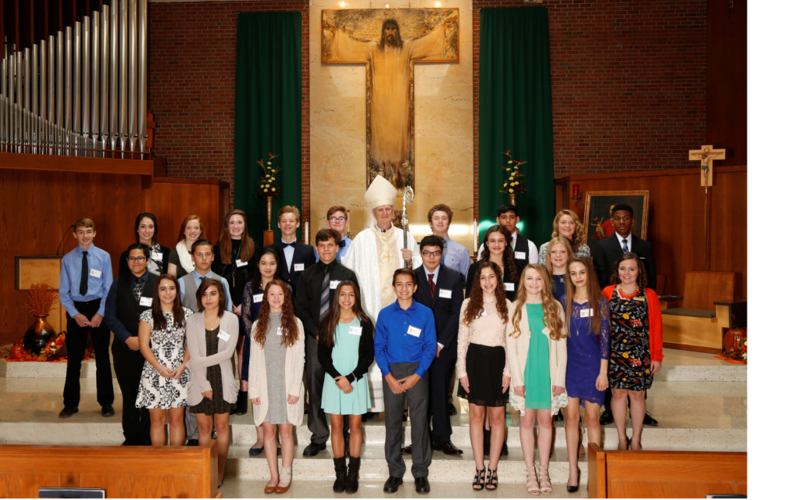 To do so, the Confirmation program strives to foster transformative faith, community, and a greater understanding of each student’s vocation. Participation in youth ministry, attendance at Sunday mass, and activities with the wider parish is part of our call to community and visible expression of our Catholic faith. For more information, please contact our Youth Coordinator, Jennifer Harris 816-436-1009 ext. 313. Adults: Adults who have been baptized in the Catholic Church but who have not received the sacrament of Confirmation and desire to do so should call to set up an appointment to meet with the Director of Faith Formation. At that time a determination will be made regarding the preparation program most appropriate for the individual. This may be either a short series of meetings leading to the annual Confirmation Rite celebrated with our Bishop or participation in the parish Rite of Christian Initiation of Adults (RCIA). Contact our Director of Faith Formation, Benjamin Darnell 816-436-0880 ext. 214 for more information. Sponsor Involvement: All candidates are required to have a sponsor, and it is preferable to have chosen the sponsor before the time of preparation begins. The Sponsor must be a confirmed, Catholic adult and may not be a parent of the candidate. The sponsor is required to attend the Confirmation sessions. All candidates are required to have a sponsor, and it is preferable to have chosen the sponsor before the time of preparation begins. The Sponsor must be a confirmed, Catholic adult and may not be a parent of the candidate. The sponsor is required to attend the Confirmation sessions. Confirmation meetings will be held in THE COMMONS and will include dinner. If a sponsor can not be present for one of the meetings, a parent or grandparent can participate in his/her place. Sunday, July 29 (5-7pm): Who is God. The Trinity. Where are they in the Bible? Rather than charging a $50-$75 fee per candidate, we are asking each family to donate time, food and/or money for Sunday dinners. We will need a lead family for each meeting to oversee the set-up, preparation, collection of food donations, and clean-up. The Sign-Up-Genius will be e-mailed to you or you can access at the bottom of the online registration form, as well. Thank you, in advance, for your time and generosity!